Exposure time is a period of the shutter from open to close. During the period, the light exposing on the chip’s photosensitive array and Photoelectric effect occurs, then photoelectric charges are produced. By the A/D transformation, the grayscale value of each pixel is displayed. Under a certain light intensity, the longer the shutter is open, the longer the exposure time, the brighter the image. Long exposure time can show the trajectory of slow moving objects on an image, and short exposure time can record things more accurately. With the development of technology, the film gradually gave way to the chip, and the control method of the shutter also changes from mechanical control to electric control gradually. When using the electric control mode, a new exposure begins when the charge of the photoelectric unit is completely emptied, and when the charge of the photoelectric unit is transferred out, the exposure ends. For the global-shutter CCD/CMOS sensor, the camera starts and stops exposure of all pixels in an array simultaneously. But for the rolling-shutter CMOS sensors, the camera only exposure one line at a time, then to the second line, etc., they read out one line at a time, by the time they read the next line, the object has moved. The difference between global shutter and rolling shutter is that whether the timing of exposure is exactly the same in the different lines of the image. As shown in the following figure 4: in global shutter mode each pixel in the sensor begins and ends the exposure simultaneously, thus a large amount of memory is needed, the whole image can be stored in the memory after the exposure is ended and can be readout gradually. The manufacturing process of the sensor is relatively complex and the price is relatively expensive, but the advantage is that it can capture high-speed moving objects without distortion, and the application is more extensive. In rolling shutter mode, different lines of the array are exposed at different times as the read out ‘wave’ sweeps through the sensor, as shown in the following figure 5: the first line exposes first, and after a readout time, the second line starts exposure, and so on. So, each line reads out and then the next line can be read. The rolling shutter sensor each pixel unit only need two transistors to transport electron, thus less heat production, low noise. 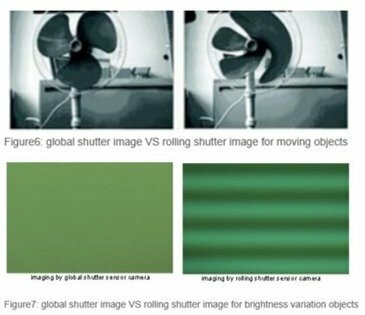 Compared to the global shutter sensor, the structure of rolling shutter sensor is more simple and low cost, but because each line is not exposed at the same time, so it will produce distortion when capturing the high-speed moving objects. ●　When capturing high-speed moving objects, distortion occurs easily in rolling shutter mode, as shown in the following figure 6: Capturing the high-speed running fan, the images of global shutter sensor and rolling shutter sensor are shown in the left image and right image respectively, the left image can restore the shape of the fan blade perfectly but the right image is deformed. ● When capturing brightness variation objects, horizontal stripes with uneven brightness may be occur in rolling shutter mode, as shown in the following figure7: Setting the exposure time to 5ms and capturing the indoor objects under the fluorescent lamp (take off the lens) with global shutter sensor and rolling shutter sensor respectively, the left image has clear water ripples in the background and the right image’s background is relatively uniform. This is because the frequency of fluorescent lamp is 50Hz, period is 10ms (a period of absolute value), the exposure time 5ms may fall in the brighter range, and may also fall in the darker range, for rolling shutter sensor, each line of the array exposes at different times, therefore, bright and dark, period variations stripes appeared in the image, but for the global shutter sensor, all lines in the sensor begin and end the exposure simultaneously, no stripes will appear. The following image sequence can interpret the imaging process of a rolling shutter sensor capturing a running dog. The dog is running from right to left, when the first line begins exposure, the dog’s head just entering the frame, and when the last line begins exposure, the dog is nearly out of the frame, each line exposes, the dog is at different position, so the final image shows a ‘split’ dog. If the moving speed is not so high, and the brightness is varied slowly, the problem which discussed above has little affect to the image. Usually, using a global shutter sensor instead of rolling shutter sensor is the most fundamental and effective method in high-speed applications. However, in some cost-sensitive or noise-sensitive applications, or if the user has to use a rolling shutter sensor for other reason, they can use the flash to mitigate the effects. As shown in the following figure9: strobe is the flash signal output by the camera, when the strobe signal is high, the strobe flashes (sometimes, when the strobe signal is low, the strobe flashes), when the strobe flashing, all the lines expose at the same time, so the image has no distortion.